Amongst all the various gourmet burger joints, fancy concepts, crazy toppings, one particular idea tickled my Northern fancy more than any other – Dip n Flip. Why? Northern boys love gravy. And Dip n Flip’s USP as I understood it was that they serve their burgers with a tray of gravy to dip their burger in as you consume it. Having sampled the Hawksmoor version of this experience (their Christmas burger, the gravy of which I managed to procure a jug of to take home after a pretty emotional experience in the basement of their Spitalfields branch), I was extremely keen to sample this take on burgeration. Another reason for my intrigue was the frankly baffling location choices. Wimbledon? Battersea? And now Tooting. Madness. They should be in a cupboard in Soho, an archway in London Fields, not somewhere near Mordor on the wrong side of the river. 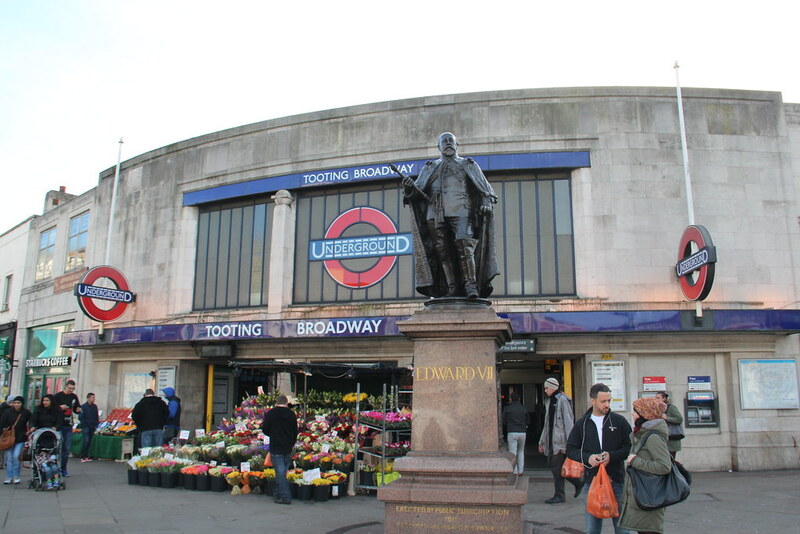 But, as luck would have it, a very good friend lives in Tooting, so we assembled a posse and headed out into what my Dad has often jokingly referred to as “Injun country” – Sarf Lahndahn. Incredibly, on leaving the tube station, nobody stabbed me, nor even accosted me. There was a nice statue of King Edward VII. The humans seemed almost the same as those in the civilised parts of London. I think I’ll drop this conceit now. So yeah, Tooting. Looked basically the same as most of London to be honest – bit hectic, some chicken shops, some posh shops that looked a bit out of place, lots of people and cars and concrete. We met up at The Antelope (a rather nice pub that, by the smells coming from the kitchen serves pretty decent food itself), then shortly made our way to the real destination, Dip n Flip. The branch is pretty much brand new at the time of writing, about a month now I guess, sitting on a relatively quiet corner tucked away from the furious pace of the tube station. It looked as much as well, very clean, crisp style with fun murals all about the place, and an open kitchen preparing the food. Our excellent waitress talked us through the food, and what else could I do but order the signature Dip n Flip Burger, with roast beef (roast lamb also available). I actually hadn’t realised this was an aspect of their burgers, but was extremely happy at this revelation. I forgot to take a pic of the menu, so here’s one off the internet. I also decided to be a bit of a fatty and go for the Cheese, Fries, Gravy with Crispy Bacon and Green Chilli. What’s the point of coming to these places and not going all in. “No half measures”, in the words of Mike Ehrmentraut. Although, that said, I did order a Diet Coke. That’s what Myfitnesspal will do to you I guess. So, on to the meal. When the food arrived, I was pretty sure that I was on the threshold of my Happy Place. To cut to the chase, it was good. Really good. My kind of food – unpretentious, uncomplicated. The burger itself was a savoury delight. I do have a bit of a rule for burgers, which I was concerned might be broken here. Basically, if you can’t eat a burger with your hands, it’s not doing its job correctly, it’s essentially a sandwich after all. Well, this one, despite all the gravy, held up remarkably well. The bun didn’t disintegrate half way through, it held together for the whole meal even as I dunked it in the delicious gravy. I wasn’t sure what kind of bun it was – seemed somewhere between a brioche and a regular bun – some digging revealed its a cream bun, which has less sugar than a brioche, so you get more of a meaty hit with each bite. I’m normally the kind that like gravy you can stand a spoon up in – this is not that sort, but it was still excellent. The burger was a good example, and cooked just how I like it, pink in the middle without the hint of raw meat in there that some places seem to favour. The beef cuts were tender and pulled apart easily as I chomped through the meal. The side I’d ordered was very enjoyable, although I have to be honest and say that for a pound more, the Meat Mission Chilli Cheese Fries is light years ahead. Different beasts, but worth mentioning. Having the heat of the fresh green chillis to counteract the sheer unbridled savouriness of the vast majority of this meal was a pleasant counterpoint, and the bacon was fantastic – crispy but not burnt, and cut pretty thick. The fries were cracking too, crispy on the outside and fluffy inside, although obviously those that were smothered in gravy and cheese lost their crunch! So all in all, a very, very gratifying experience. I’d do it again in a heartbeat [insert own joke about burger-induced heart disease], although currently the three available locations mean that its extremely unlikely I’ll do it on a whim. I see no reason why Dip n Flip wouldn’t expand around both London and the UK, although I really wouldn’t be surprised to see imposters spring up or more established chains try to nick the concept. Its a great name though, and all the staff were really friendly too, so I can only wish them the best in expanding and growing as they see fit!